If you love helping others travel to their dream destinations you can find a Carnival Cruise work from home job. You can also visit the work at home companies page for other similar positions. 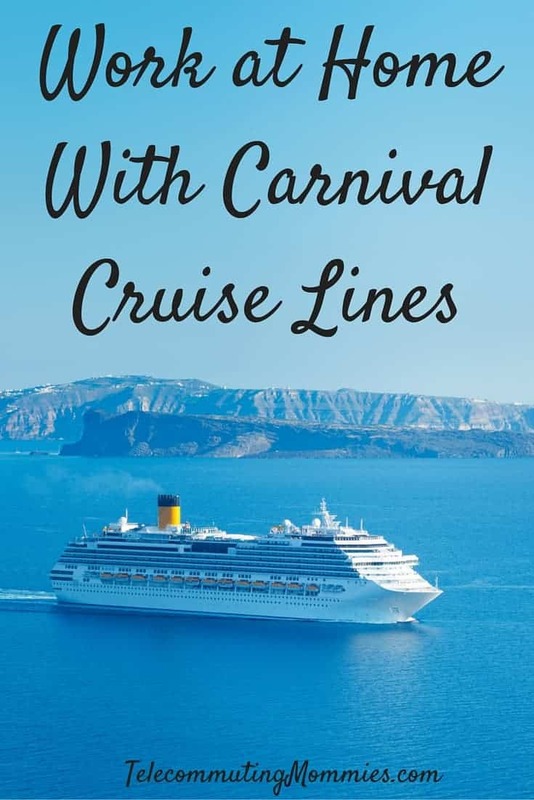 Carnival Cruise Lines is known worldwide for their extravagant vacation destinations but did you know you can find a Carnival Cruise work at home position? There are several different ways you can work at home with this company. Read on to find out if it is a good fit for your work at home career. Carnival Cruise Lines occasionally hires telecommuters for their virtual call center. These positions typically require a high school degree, excellent listening skills, creative problem solving and basic computer skills. This position will answer incoming calls from guests, travel partners, ad internal team members on existing individual and group bookings. Virtual call centers work the same way a regular call center works with calls routed to different phone operators except for the fact that the virtual call center agents work from home. As with most virtual call center jobs you need to have your own computer, internet access, and a quiet work background. The vacation planner position with Carnival Cruise Lines is more of a sales position and requires outgoing phone calls. You need to be comfortable with building your own database of customers and being able to close sales with your customer database. You must be competitive and highly motivated. Required skills include being PC literate and have at least two years of sales experience. You must have your own computer and high speed internet for both positions with the company. The job postings claim that vacation planners can make an average of 55K-60K a year with top producers making over 90K. Some past employees having posting online claim to only be able to make around 20K a year which is a big difference. The pay is based greatly on commission so it could be possible that only those who excel at sales are going to make the kind of salary promised but I would be sure to check and be comfortable with the pay structure before signing on. Carnival hires agents on as employees, not independent contractors. This means you receive benefits including a 401K, tuition reimbursement programs, employee stock purchase plans, paid time off, and 2 complimentary “Fun Ship” cruises a year. Most companies do not hire work at home agents as employees but rather as independent contractors so this is great for those lookinng for benefits. The company is not always hiring for these positions but if you do not see them listed in the job postings, check back often to apply. Visit the Carnival Cruise Line job site to apply.